The London Marathon is one of the world’s biggest in numerical terms and best if you look at the performances of those at the head of the field. However, were you to ask any Scottish marathon runner how many Scots had finished in the first five or six in the event’s history, you would certainly get Allister Hutton, maybe get Jim Dingwall and then there would be the guesses at John Graham, Peter Fleming and others. Very few would come up with Aberdeen’s Graham Laing who was fifth in the first ever London Marathon, two places ahead of Jim Dingwall. He was also among the most modest of champions – I remember after he had won the SAAA title in 1980 hearing a runner who had dropped out at ten miles telling him he would have won it himself if he hadn’t got blisters! Not a word of congratulation did he utter and Graham listened quietly and went about his business. What follows is an account of Graham’s career written by Colin Youngson and the training described therein is informative, educational and not for the faint hearted. 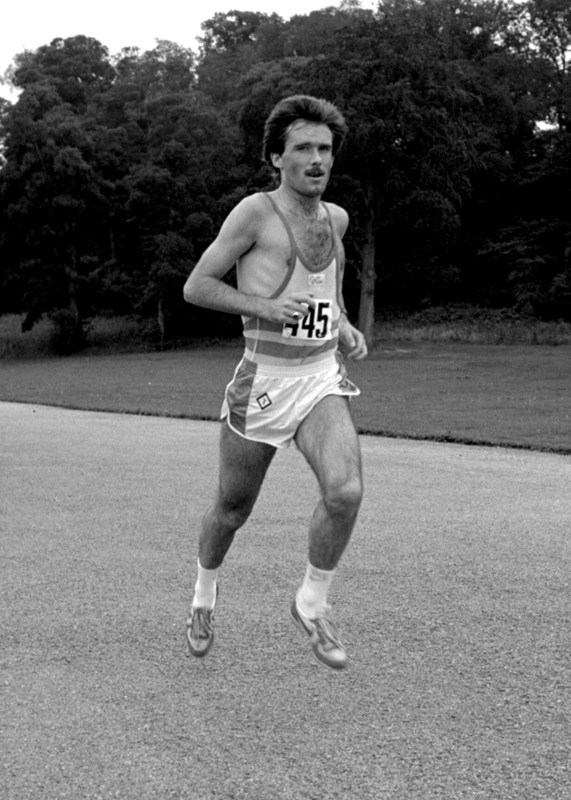 By the end of 1979 Graham Laing, born 1/11/56, had become Aberdeen AAC’s most successful distance runner having won the SAAA’s 10000 metres title plus his first marathon, the inaugural and rather hilly Aberdeen event when he defeated the redoubtable Jim Brown by 42 seconds after quite a duel in 2:21:40. Graham started his career by going out running while at Robert Gordon’s College instead of playing rugby with which he had become disheartened because of his light frame. In his fifth year he became the first Gordonian to gain full cross country honours. Before that he had joined Aberdeen AAC in 1970 after meeting the legendary Alastair Wood who saw his potential immediately. One of his secondary school teachers was Graham Milne, later a 2:21 marathon runner. Mr Milne helped young Laing develop his running at school and from 1977 onwards was an important training partner. The year before that, in 1976, Graham Laing (with Fraser Clyne, Steve Cassells and Danny Buchan) had been in the AAAC team which won the SCCU Junior Cross Country title. Graham Laing was enormously talented as a runner and made rapid progress with what looked like considerable ease. Yet his training by 1980 was 80 miles a week in winter and 55 in summer. he fitted in morning 7 mile runs before his work, one evening track session, three hill sessions, weights training and some more long runs during each week. This regime, inspired partly by Frank Horwill and Mel Edwards, seems tough enough. Sunday’s run was 16 – 20 miles with Fraser Clyne, Peter Wilson, Graham Milne and the rtest of the club’s strong squad at the time. Monday was easier, Tuesday hill repetitions or up to 16 x 400 with 30 seconds recovery; Wednesday the club run which ‘sorted the men from the boys’, followed by a pint in the pub; Thursday might be easier or or an ‘up the clock’ – one minute hard, one easy, two minutes hard, etc up to six minutes hard and then down again; Friday was an easy run; Saturday a race or two short fast runs. Sadly, two months before the Scottish Marathon Championship in 1980 Graham’s Mum died. She had wanted him to keep training and do his best and he certainly kept the promise. He was twenty seconds clear of the field at the turn and, despite the headwind on the way back being brutally strong, Graham kept on extending his lead finishing on the Meadowbank track in 2:23:03, almost two minutes in front of Colin Youngson. Graham finished “so happy for myself, Aberdeen AAC and of course for my Mum.” And that was only the beginning. Not only was Graham to be a vital component of AAAC’s winning Edinburgh to Glasgow winning team in 1983, 1986 and 1988, but he was to make his mark as a very good marathon man indeed. The 1982 Commonwealth Marathon Trial was the AAA’s event in Gateshead on June 13th, 1982. Jim Dingwall who had run in the 1978 Commonwealth event, battled throughout with Graham Laing. John Graham was fourth (and first Scot) in 2:15:14 with Jim fifth in 2:15:30 and Graham sixth in 2:15:39. The Scots chose John and the improving Graham Laing. Jim was very unlucky and realised that there were financial restraints that prevented three marathoners being selected – and philosophised that fairness was not always to be expected in life. He wished Graham well. In the 12th Commonwealth Games in Brisbane, Australia, the marathon took place on the second last day, October 8th 1982. Graham remembers socialising with Allister Hutton, Nat Muir, John Robson and the inimitable, wise-cracking John Graham who set a ferocious pace during training runs. The actual race started at 6 am before the heat built up, and it seemed strange to complete a marathon before breakfast. Obviously someone had learned from the cautionary tale of the 1954 event. The holder, Gidamas Shahanga, and his Tanzanian teammate Juma Ikangaa broke away. Rob de Castella of Australia led a chasing group comprising John Graham and Graham of Scotland plus Kevin Ryan of New Zealand. They passed ten miles in 49:06 and halfway in 64:10 (40 seconds down on the Tanzanians). After 25k, ‘Deek ‘ , who was very strong over the Queensland University hills, started to come through to a narrow victory over Ikangaa with the Scottish duo performing well to secure fourth and seventh places. Unfortunately it had to be an Englishman, Mike Gratton, who passed John Graham in the last two miles. With Jim Dingwall running, Scotland could have won the ‘team race’.The result was: 1. Rob de Castella 2:09:28; 2. Juma Ikangaa (Tanzania) 2:09:30; 3. Mike Gratton 2:12:06; 4. John Graham 2:13:04; 5. Kevin Ryan (New Zealand) 2:2:13:42; 6. Gidamas Shanga 2:14:25; 7. Graham Laing 2:14:54; 8. Ian Ray (England) 2:15:11. That brave battle was probably Graham’s finest performance. Other good marathon times included 2:15:29 at Sandbach in 1981, and 2:14:20 at London in 1983 when he was nine seconds in front of his clubmate Fraser Clyne. His 10000 metres personal best was in the Aberdeen Club Championships in 1983 when he dead heated with Clyne in a club record of 29:22. Graham’s half marathon best (set in Holland) was an impressive one hour one minute! Nowadays (2010) he still glides to and from work (as manager in the Inverness branch of Run4it. Every year he takes part in the prestigious Inverness half marathon and usually wins his age group! Colin describes the Commonwealth Games marathon as Graham’s finest race. There were what might be called ‘predictors’ in his form before he went to Australia. The previous season he had been second in the Scottish marathon rankings behind John Graham and he built on this in 1981. His best 5000 metres was 14:33.9 that placed him sixteenth on the Scottish ranking lists, he had two remarkably similar 10000 metres track races run in 30:08.0 and 30:08.8. When he went to Australia he had a swift 3000 metres in 8:18.8 just thirteen days before the race itself. The result of the marathon meant that John Graham and Graham Laing were first and second in the rankings for the second successive year. It would have been three years in a row but in 1983 Jim Dingwall slipped in between dropping Graham (2:14:20) to third and his excellent 10000 metres time for the season is noted above.